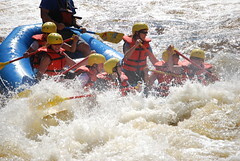 Last week, I had the opportunity to go white water rafting with a group of volunteers. It was a team building/thank you for those who give of their time to the army families who live here. There were many “nervous” women before the trip started. I had been rafting on the Snake River in Wyoming so I knew what to expect. It all depends on how good a river guide you have and thankfully, our raft had a big, burly, competent guide. By the end of the trip, all those women were ready to go again!! Not only was it a gorgeous summer day with temperatures in the low 80s but the river was “high” due to the recent rains. It was a fast, fun ride. According to the weather, we’ve got another week of warm temperatures so I’m hoping to get Favorite Man out on the water before the season ends. There are two other rivers to raft, the Moose River and the Salmon River ~ rrafting is one more “fun” thing to do while we’re living here. That water looks pretty roughbut I’m sure all of you had a lot of fun.